Meet Tigust, 19 years old, one of ten children. 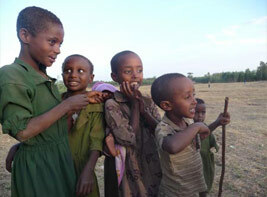 By Ethiopian standards Tigust’s family is not poor. Both her parents worked and were able to support the family. Tigust was a year and a half into a three-year nursing course and doing well, when her mother died. Her father was still able to support the family but could no longer afford the nursing course fees. To complete the course Tigust required £275, a vast amount of money. Tigust came to see Sister to ask for a loan in order to complete the course. That’s when we got to hear her story. We faced a dilemma - a loan would put her in debt before she had even started work. Giving her the money from your donated funds would reduce the number of houses we could have built. With a decision of this nature we always feel that Sister knows best and based on her advice we gave Tigust the money to continue her studies. Our reckoning was that once qualified, and after talking to her we have no doubt she will, she will not only be able to contribute towards her family but will serve the community in the local hospital. Nurses are in great demand in Ethiopia.